We founded this nonprofit originally as the Rolling Dog Ranch Animal Sanctuary in December 2000, when we left our corporate jobs in Seattle and moved to a 160-acre ranch in the Blackfoot River Valley of western Montana. Our dream was to create a special place for animals with disabilities. These are the animals who are often the least likely to be adopted and among the most likely to be euthanized in traditional shelters. From the outset, we had named the ranch the “Rolling Dog” because our dogs loved to roll around on their backs in the sagebrush- and grass-covered meadows there. After ten wonderful years in Montana, we moved our operations during the spring and summer of 2010 to an equally beautiful old farm in the White Mountains of northern New Hampshire. You can read about why we relocated on our blog here. Once we got settled, we changed the name to Rolling Dog Farm it seemed a much better fit for New England, and everyone here calls us a farm anyway! 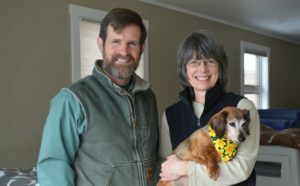 Steve and Alayne with blind Sophie, who came to us from a California shelter. Even though our location and name changed, one thing stayed the same: The dogs and the horses! still love to roll around on their backs in the lush and green New Hampshire grass! Our disabled residents are remarkable animals. They are happy, energetic and loving. Many of our visitors can’t believe the animals they see romping with each other and running around are blind or cope with some other kind of handicap. There isn’t a single animal here who feels sorry for himself or herself. Each and every one of them loves being alive. That’s really the ultimate inspiration for us. Despite their disabilities, they want nothing more than a chance to enjoy life. And that’s what they get to do here.